Poor "nick4ever". All he wants to do is buy a loaf of bread from the supermarket, but the store's policies and procedures get in the way of him accomplishing this seemingly simple task! What appears to be a completely absurd situation is actually something that many online shoppers have to deal with on a regular basis. Some online stores have less-than-user-friendly steps that need to be completed for the customer to make a purchase. When visitors get frustrated, they leave the site and go find another place to make their purchase. Making it easy for your customers to complete a task on your site (like buying a product) is extremely important because, unlike in the real world, going to a competitor's shop is only a click away! Once you have these goal funnels set up correctly, you can view the Funnel Visualization report which gives you an idea of how many visitors leave your checkout process at each step. Steps in the funnel that have a large dropout rate can indicate that visitors may be confused or frustrated with that particular page. Maybe there is new information (like a shipping charge) that scares them off? Or you are asking for information that they are unable or unwilling to provide? Is it possible that the page is just broken? You may want to investigate those pages with large drop-off rates to see if there is some way to make them easier for your customers to complete. In a process like a checkout, there are many ways that a visitor can experience a error message from a website. Incorrectly filling out a form field, forgetting to tick a box or taking too long are a few of the reasons why your checkout might raise an error to the visitor. Hopefully your error messages are clear and help your visitors correct their mistake, but is there something that you, as the site manager, can learn from them? There are a lot of different web browsers out there! When developing a web site, it can be difficult for your developers to test every bit of functionality on every single browser on every type of platform. This gets even more difficult when trying to take into account all of the different mobile browsers as well! 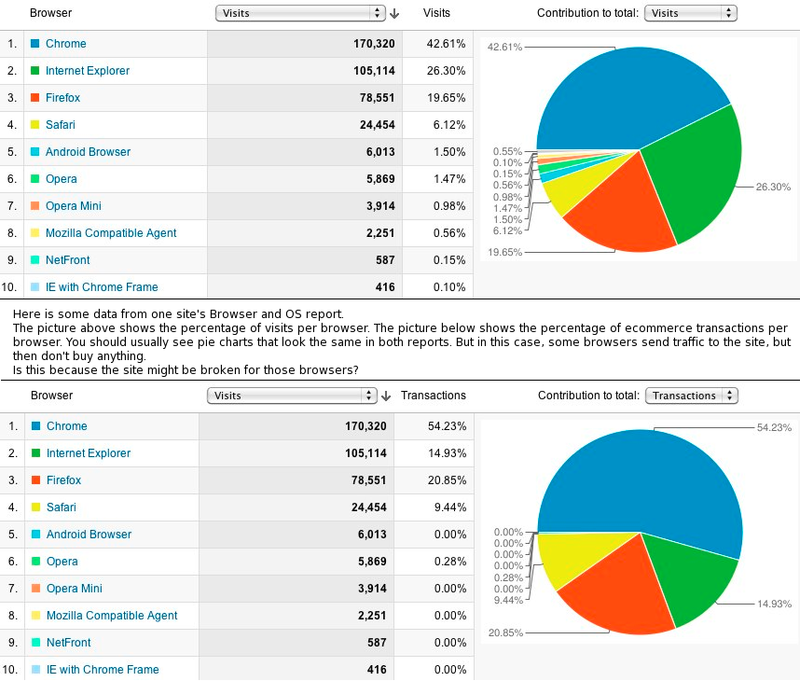 If you have a look at the Browser & OS report you can see which browsers your visitors use to access your site. 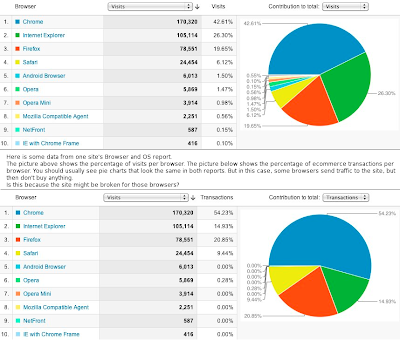 This should give you a better idea of which browsers you should test on your site. To go even deeper, choose the option in the Browser & OS report to view how each browser contributes to total goal completions. If you switch between these two views, you should hopefully see similar pie charts where the percentage of visits from a particular browser is roughly the same as the percentage of orders for that browser. If 20% of your visitors use the Chrome browser, you would expect that about 20% of the orders placed would be from Chrome users. However, if you see, for instance, that 10% of your visitors use Safari, but 0% of orders come from a Safari browser, there may be a bug on your site that prevents users of that browser to finish placing an order. It might be useful to further investigate any browser incompatibilities that you discover. As a website owner, you should strive to make your site as easy-to-use as possible for your customers. The data in Google Analytics and some of the tricks mentioned above can help you with this important job. Beyond this, there are several more tools like Site Speed Reports, Intelligence, Site Search and Google Website Optimizer which can help you further improve your site. If you need more help in setting up Google Analytics, consider working with one of our Google Analytics Certified Partners or purchasing Google Analytics Premium.